Above, a picture with a bigger zoom. 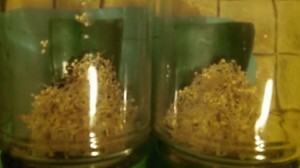 The intensity obtained is 310 µA but decreases rapidly around 130-150 µA. 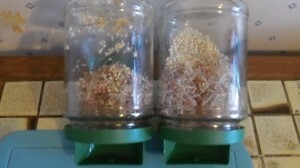 The objective of this experiment is to verify the influence of cold on the germination of quinoa seeds. 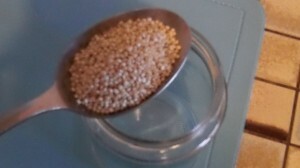 Above, a zoom on the box of quinoa seeds. Above, a zoom on the seed trays. 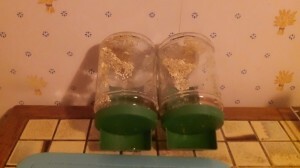 The first thing to do (picture above) is to wash well the seed trays. Adding a small quantity of dish soap is a plus. 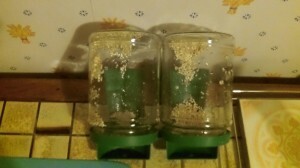 Indeed, the seed trays cannot be washed in the machine. Seed trays are turned and dried in the sun (08/08/2012 at 1.30 pm). 3 hours later (4.30 pm), the seed trays are ready ! Please note that after an hour and a half, I turned them (opening on the top) to also dry the interior. There, we are ready. We have the seeds and tray ready ! A this point, it is very simple. You just need to add a tablespoon of seeds in the tray ! Voilà ! We now have a seed tray ready to start the experiment ! 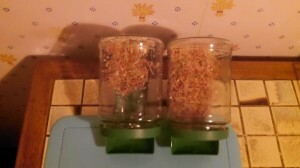 Above, a picture of the 2 seed trays. 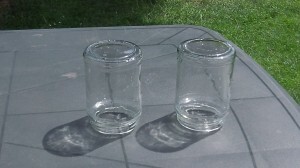 One will be placed in a fridge and the other will wait on the kitchen table. 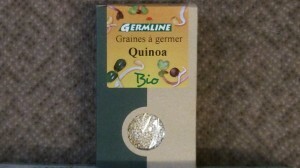 Here is the picture of the tray with quinoa seeds placed in the fridge. At this point in the experiment, it is 5 pm. I plan to leave the tray at this place for 8 hours, so until 1 am. The other tray (number 2), as indicated, will wait on the kitchen table until the tray number 1 finishes its “preparation in the cold”. 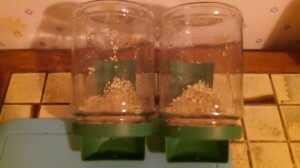 Therefore, it will be possible to compare the influence of cold, before the germination phase, on the germination of quinoa seeds. 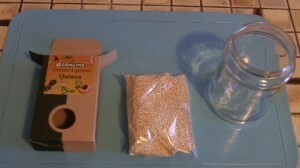 We will then be able to know if “preparation in the cold” is advantageous to a better germination. As agreed, at 1 in the morning, I removed the tray 1 from the fridge and started the soaking process. 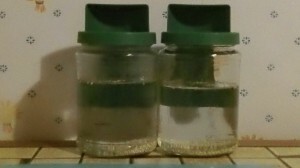 Soaking is a step that enables to activate (wake up) the seed. 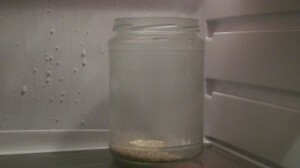 Above, a picture of tray 1 after 8 hours in the fridge. Soaking is something very simple. 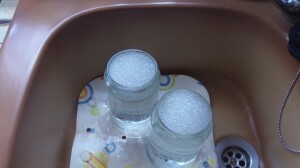 You juste need to put water in the tray then close it with the cover. That’s all ! Here, the trays have been filled with French Mineral Bottled Water Vittel (that’s all I had at hand). Soaking time for quinoa is 2 hours. But that depends on the nature of the seeds. 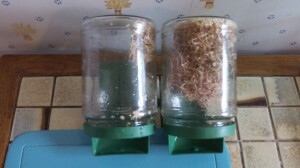 For example, the time needed to soak cress seeds doesn’t exceed 1 hour. On the contrary, soaking time for corn seeds is near to 20 hours ! And wait for the seeds to drip (tray up side down). 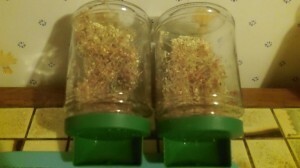 Everyday, when you wake up and go to sleep, you need to humidify the seeds. 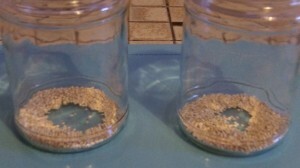 For this, through the pierced cover, fill up half way the tray with water then shake well. 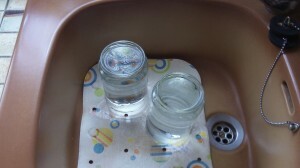 Once this done, empty the water through the pierced cover and leave to drip. The twice a day humidification job doesn’t take much time. 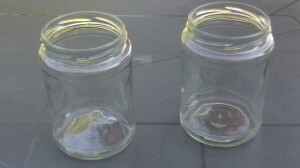 Filling a half jar, shaking, emptying the water and leaving to drip doesn’t take more than a minute. 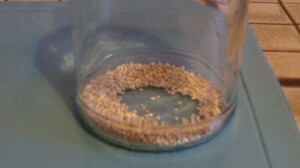 We can see that the seeds have already started to germinate. On August 11th 2012 at 1 am in the morning, I carried out “humidification night 2”. 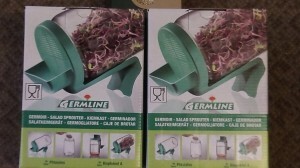 Humidification is very important, especially during the summer, otherwise the seeds risk to get some sort of moulds. If humidification is done twice a day, normally there is no problem. 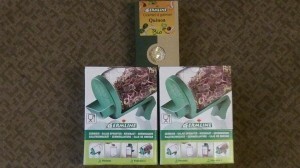 A third humidification in the day can be a “plus” for the seeds. If you have time, also think about untangling them so that they do not stay stucked together. Always remember to rince them before eating. 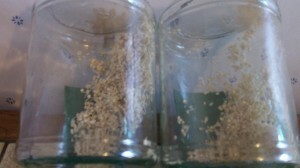 Note : The germinating seed of quinoa has a light bitter taste. 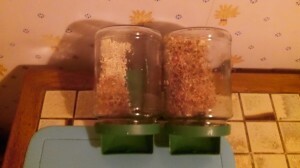 Given the fact that for many years we have been used to a western industrial food diet, it is less likely that the “average consumer” will be able to eat a bowl of germinating seeds of quinoa in one shot. 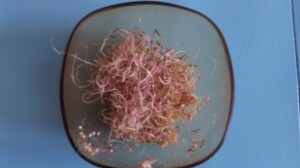 It is therefore recommended to eat by pinches, then stop when you feel the taste is too much. Personaly, I had many pinches in the day. It “raises the throat a bit”, which is not bad for talking (or singing). In any case, concerning me, that’s how I experienced it. It’s very light, no particular problems noted during the day. I even had the impression that it helped cope with headaches. 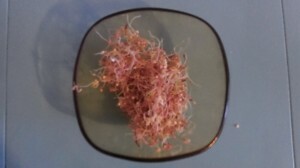 For dinner, I had a pretty “normal” meal in which I added a few light pinches of germinating seeds. So there is, I think, few luck that an “average consumer” will change fast to a high consumption of germinating seeds of quinoa because our “western industrialized” palate is not used to it. Consequently the idea is to simply eat a bit less of meat and to add a few pinches of germinating seeds in your food (at an acceptable amount for your palate). Thus, being mixed, it’s consumed easier. And you also increase your percentage of raw food, which can only be an advantage for you and your general health in the next weeks ! The first tray was used for my personal consumption. The content if the second seed tray was given to a vegan friend. I happen to eat a few pinches. But I mostly use it as a complementary ingredient in meals. 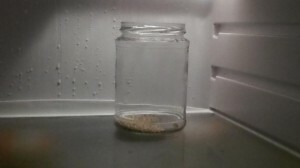 To answer the original question, I would say that the 8 hours in the fridge didn’t seem to me to have had an incidence on the germination speed. 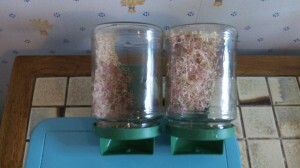 During the summer 2012 Francophone Meetings, I was able to build a rhubarb generator. The objective of the experiment was to reach 12 V with 2 leafstalks of rhubarb. 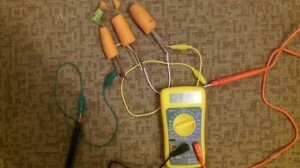 So I continued to cable the rhubarb pieces in series to increase the voltage. And there! I got past 6 V ! On this 3rd picture, we can see that the 11 V have been exceeded ! 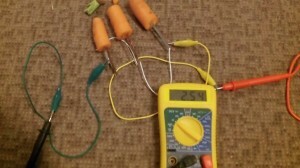 This is the picture zoomed on the multimeter. It shows 11,30 V ! A week and a day later, the rhubarb has aged well. It has become black. 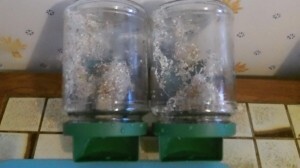 Here we can see a mould formation. Here we can see well the colour transformation from dark pink to black. Tension has well decreased. It is now at 2,08 V.
On the intensity side, we have 145 µA. As for the electodes, we can immediately notice a strong oxydation to anode (the rode is zinc). 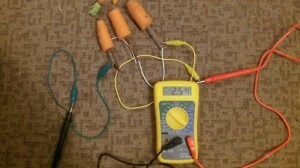 To the question « Is it possible to create a 12 V rhubarb generator ?« , the answer is yes (and even more). On the one hand, it doesn’t last a week (contrary to the potato generator, which on it’s side, has the disadvantage to take up more space than the rhubarb generator that has a good ratio tension / space).